ELIGIBILITY Any U.S. woman is eligible to apply, if she also meets all of the criteria as specified at www.aspirations.org/ AiCCollegiateAward. 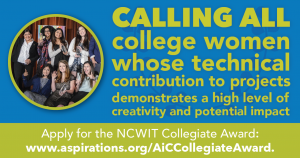 APPLICATION DETAILS The 2019 NCWIT Collegiate Award will be conducted in two rounds: Preliminary and Finalist. Preliminary Round: Students may apply online at www.aspirations.org/AiCCollegiateAward, beginning on September 1, 2018 and no later than 8:00 p.m. Mountain Daylight Time (MDT) on October 15, 2018. Finalist Round: Applicants representing three categories — (1) freshmen, sophomores, and two-year college students; (2) juniors and seniors; and (3) graduate students — will be selected from the Preliminary Round to participate in the Finalist Round. Students selected for the Finalist Round will be invited to complete their application online, beginning on December 10, 2018 and no later than January 18, 2019. 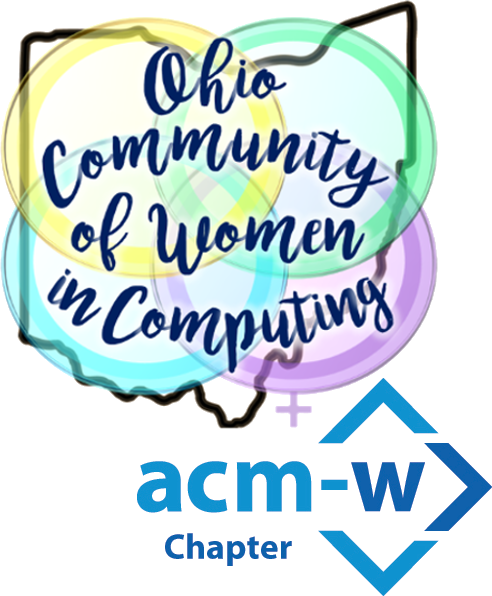 ABOUT NCWIT The National Center for Women & Information Technology (NCWIT) is a non-profit community of more than 1,100 universities, companies, non-profits, and government organizations nationwide working to increase girls’ and women’s meaningful participation in computing. NCWIT equips change leaders with resources for taking action in recruiting, retaining, and advancing women from K–12 and higher education through industry and entrepreneurial careers. Find out more at www.ncwit.org.